Remotely sensed (RS) imagery is increasingly being adopted in investigations and applications outside of traditional land-use land-cover change (LUCC) studies. This is due to the increased awareness by governments, NGOs and Industry that earth observation data provide important and useful spatial and temporal information that can be used to make better decisions, design policies and address problems that range in scale from local to global. Additionally, citizens are increasingly adopting spatial analysis into their work as they utilize a suite of readily available geo-spatial tools. This paper examines some of the ways remotely sensed images and derived maps are being extended beyond LUCC to areas such as fire modeling, coastal and marine applications, infrastructure and urbanization, archeology, and to ecological, or infrastructure footprint analysis. Given the interdisciplinary approach of such work, this paper organizes selected studies into broad categories identified above. Findings demonstrate that RS data and technologies are being widely used in many fields, ranging from fishing to war fighting. As technology improves, costs go down, quality increases and data become increasingly available, greater numbers of organizations and local citizens will be using RS in important everyday applications. A review of the literature regarding the application of remote sensing (RS) data and techniques to solve problems, address policy implications and improve decision making indicates a strong preference for studies focused on land use and land cover change (LULCC). This is not surprising given that earth observation (EO) data provide important and useful spatial and temporal information for studying changes in the natural environment; particularly those caused or affected by human actions, as well as for understanding what these changes are doing to us. As this awareness grows, governments, the public and industry are becoming responsive to the importance of ecosystem goods and services and the monetary value that must necessarily be placed on them [1,2]. For example, new programs are being developed, known as payments for ecosystem services (PES) to conserve natural areas, mostly in developing countries . One such program is known as REDD1—reducing greenhouse gas emissions from deforestation and degradation. It draws on financial resources from developed countries to halt deforestation in forest-rich developing countries [4,5]. Toward this aim, advances in RS are improving understanding of social and ecological systems functioning , which can range from intact native ecosystems to highly modified ones . A central approach for comprehending dynamic landscapes is to recognize that vegetation is a driving force in terrestrial ecosystems and is often used as a proxy for classification . This is noteworthy, since the type of vegetation growing in a given region provides an indication of climate (namely temperature and rainfall) and thus the type of socioeconomic activities that are likely to be found there. Furthermore, LULCs influence climate change. Categorizing and examining landscapes, therefore, is a common topic in much of the LUCC literature. Here, remote sensing data are regularly utilized to assess spatial and temporal dynamics usually within a geographic information system (GIS) that is then used to analyze and map these patterns . While much work focuses on using discrete classifications, whereby given land uses and land covers are placed into distinct categories, others prefer to use continuous data. The latter acknowledges that real landscapes do not abruptly end or sharply transit from one type to another. Using continuous data, such as vegetation indexes (e.g. Normalized Difference Vegetation Index, or NDVI), provides a more accurate representation of real world transitions between different landscape categories [8-10]. Consequently, a central focus on LUCC has been on deforestation, namely via agriculture, and logging, since these are direct drivers of landscape change. However, secondary, distal, or underlying drivers leading to such changes have socioeconomic, cultural, political and environmental explanations that vary by scale [11-14] and are harder to discern, since a RS image can show what is happening but not necessarily why. • Monitoring urban expansion, urban sprawl, slums and heat island effects through the use of daytime and nighttime imagery, as well as ground temperature and urban vegetation [15-25]. • Global fisheries management , including night time squid fishing efforts in the Pacific , increaseing fishing efficiency while reducing costs , improving aquaculture, such as shrimp farms ; tracking lobster movements ; detecting chlorophyll concentrations in the ocean and estimating phytoplankton mass and prey availability [28,31,32]; improving algorithms for classifying and monitoring algal blooms [33,34] and detecting and mapping broad scale coral reef changes . • Modeling wildland fires and gauging potential damage from coal seam fires and detecting burn scars [36-38]. • Producing high-quality bathymetric maps . • Monitoring drinking water quality, turbidity and water quality in coastal and estuarine waters [40-41]; improving efficiency of hydroelectric reservoirs and assessing cumulative environmental alterations resulting from new dams [42,43]. • Detecting thermal plume discharges from nuclear power stations . • Monitoring and mapping salinity distributions in coastal environments ; identifying coastline changes and associated impacts  and improving edge detection in ocean color images . Also, detecting sea ice for arctic monitoring  and forecasting glacier melting [18,49]. • Improving accuracy in archaeological work, detecting buried objects and identifying potential historic sites. Monitoring the evolution of mining induced subsidence [50-56]. • Studying historic debris flows and identifying potential ones at stratovolcanoes . • Identifying villages and urban areas at high-risk of malaria transmission and tracking mosquito habitats [58-61]; modeling seasonal and inter-annual patterns of climatic suitability for mosquitoes  and guiding aid efforts to areas with severed communications such as those following a major earthquake or cyclone [63-66]. • Modeling the impacts of a liquefied natural gas tanker explosion . • Detecting infrastructure alterations related to oil exploration and production activities [68-72]; deforestation and soil contamination [73,74]. • Military operations such as pre-mission planning and post-mission analysis, providing situational awareness for warfighters, developing threat analysis and identifying terrorist hideouts [75,76]; and netcentric warfare, which allows “warfighters to plan, execute, report and visualize a common operating picture” . Given the broad nature of such research, data derived from remote sensing technologies are necessarily complemented with additional or ancillary data. This includes in situ measures; information about ecosystem goods and services; elevation, air and water temperature; rainfall data; hydropower potential; salinity; risk for erosion; the amount of carbon storage; displacement of local communities; habitat fragmentation and loss of wildlife; downstream and drinking water quality and quantity; wind speed; chlorophyll-a concentrations; agricultural production and the impact on food security; and health effects among others. Having addressed the commonalities that exist in the LUCC literature, this review paper provides an insight into how RS-derived data are being used beyond traditional LUCC maps and images to better understand human-environment interactions, solve problems and address policy issues. Nevertheless, it is impossible to decouple the natural and cultural (human made) landscape from these studies since humans live and operate in particular locations whose specific qualities and histories provide a suite of possibilities to which inhabitants adapt in a variety of ways. This underscores the importance of understanding and implementing geographic thought and spatial analysis. Thus, while traditional LUCC studies might focus on how humans interact with and transform the landscape, understanding why, and what are some of the socioeconomic effects, which takes us to the secondary drivers. Not surprisingly, given the multidisciplinary nature of this type of the research, a review of this literature indicates that the work being done does not necessarily fall into clean categories such as economics or health or risk assessment. Many of these issues are intertwined. For example, floods in Bangladesh have environmental components (monsoon rains) that are exacerbated by lack of planning, population growth, lack of funding for proper infrastructure, non-enforcement of construction/settlement policies in high-risk areas, bureaucracy in terms of several and often overlapping agencies, land speculation, and loss of arable land among others . This paper, therefore, groups work that is similar into the following categories: Fire Models and Methods; Coastal and Marine Applications; Infrastructure and Urbanization; Archaeology and Remote Sensing; The Ecological Footprint, or the Landscape Infrastructure Footprint, and Ecosystem Goods and Services. These sections also address the types of ancillary data used in these research papers as well as the type of RS data involved and relevant characteristics (when provided). The Conclusion and Future Research sections follow. Given the breadth of this topic, this review provides a general introduction to the following topics and is not exhaustive. Readers are directed to the numerous references at the end of the paper, as well as the future research section, that identifies 13 well-known RS journals. Wildland fires pose a major environmental problem for many of the planet’s ecosystems and can become an important cause of land degradation and environmental transformation [36-38]. Furthermore they pose a substantial economic risk in terms of lost forested land, loss of soil nutrients which can affect agricultural production , affected homes and property, as well as a health risk to nearby populations and a danger to fire fighters. One way to develop management scenarios for wildland fires involves using RS to detect the spatial distribution of fuel types in order to create more robust fire models . Aerial photo interpretation is widely used by forest managers and government agencies, because it provides a compromise between price and precision, and is therefore “one of the most commonly used techniques for mapping vegetation and fuel types” . These authors note that satellites are also being used to study forest fuels, but a main drawback is their inability to penetrate forest canopies. Nevertheless, using QuickBird imagery, some researchers have reported fuel map accuracies of 75% to 81% . Investigators, such as Chuvieco et al. also consider moisture status of vegetation, ignition sources and stakeholder values in their work. Using mainly Landsat TM images, the authors were able to map and classify fire scars over time in the Cape Canaveral National Seashore in Florida using the categories burned and unburned. The objective was to establish sound management practices that balanced managed with natural fire regimes. Duncan et al. note that remote sensing techniques can prove suitable for fire monitoring as well. For example, for recent fire history at coarse scales, they suggest using MODIS Fire (Moderate Resolution Imaging Spectroradiometer) (see [80,81]), TRMM VIRS (Tropical Rainfall Measuring Mission, Visible and Infrared Scanner—4.4 km2 pixels) and ATSR-2 (Along-Track Scanning Radiometer—1 km spatial resolution) [79,82], though in their work they relied on LANDSAT TM (30 and 120 m)  imagery to help detect burn scars, among other features. But “For longer fire histories, especially when fine detail pattern information is necessary, mapping fire scars from a time series of high resolution imagery is preferred,” . Smith et al. concur on the need to use higher spatial resolution satellite imagery than that provided by Landsat ETM+ (15, 30 and 60 m) [83,84]. In particular they refer to the importance of identifying the white ash that remains after fires, which provides an indication of fire severity. Coal seam fires create another important fire risk, particularly in China, where 70% of the country’s energy is derived from coal and where an estimated 20 Mt of uncontrolled fires burn there every year . In such cases Voigt et al. propose an integrated satellite remote sensing approach to detect and monitor “near surface coal seam fires by observing land surface changes induced by fires” that includes digital elevation models (DEMs), radar and MODIS (250, 500 and 1000 m), QuickBird (0.50 cm to 2.4 m), ASTER (15, 30 and 90m) (see ) and Landsat 7 ETM+ data [84,85,87]. The monetary costs associated with these fires stem from not only the loss of the burnt coal itself, but also from the loss of accessibility to nearby mining operations . Furthermore, these uncontrolled coal fires lead to environmental stresses through the release of large amounts of toxic and greenhouse gases such as CO, CO2, CH4, SO2, and NO . Prakash et al. used Landsat imagery to identify coals seam fires burning in Alaska based on summertime thermal infrared temperatures. Noting that many of these fires go unnoticed and unreported in inaccessible areas, the authors found that coal seam fire zones exhibited temperatures 5˚C to 14˚C higher than surrounding areas . Using Landsat ETM+ imagery, the authors focused on band 6 (low-gain band 61), the thermal infrared band, which operates in the 10.4 - 12.5 μm spectral region and has a spatial resolution of 60 m. Thus, high-resolution imagery was not necessary for this approach. The SeaWIFS (Sea-viewing Wide Field-of-view Sensors) Project (see ) provides quantitative data on bio-optical properties (color) of the world’s oceans, based on chlorophyll and other plant pigments, whose higher concentration make the water greener [28,31]. For example, high-resolution airborne data have been used to estimate chlorophyll-a concentrations in Alaskan coastal waters in reference to phytoplankton biomass and prey availability for the Steller sea lion . For these types of studies the authors noted that satellite footprints had two main limitations: chlorophyll-a variations require scale detection less than 1 km, and stray light from land and bottom radiance of shallow waters tend to contaminate near-shore pixels (Montes-Hugo et al., 2005). Meanwhile, Zagaglia et al. examined the relationship between tropical Atlantic yellowfin tuna and environmental variables obtained from remote sensors in support of global fisheries management and the capture of pelagic species. They examined sea surface temperatures using Advanced Very High Resolution Radiometer (AVHRR) data onboard NOAA satellites (1.09 km) [89,90]; concentration of chlorophyll-a using SeaWIFS data from the SeaStar satellite; sea surface height anomaly information gathered from TOPEX and Poseidon altimeters; and surface wind data collected by scatterometers aboard the European Remote Sensing Satellites ERS-1 and -2. The authors found that tuna catch was strongly associated with the position of the Intertropical Convergence Zone (ITCZ) . In another study, Rajitha et al. discussed how satellite RS technology and GIS were being used to sustainably manage shrimp aquaculture in India. Here, management is important due to mangroves, coastal and marine resources, and agricultural rice lands being used and converted to create shrimp farms. At the same time, shrimp farms create rural employment and economic development in coastal villages, contributing “a major portion of national income through high export earning” . Studies examined by the above authors note the effective use of Indian Remote Sensing Satellites (IRS), with 5.8 m to 1 km m resolution , Landsat TM and ETM+ for observing biological productivity and for monitoring coastal water temperature and quality . In an additional application of RS to fishing, Santos  noted how “satellite delivered fishery-aid charts can reduce 25% - 50% of US commercial fisheries search time,” greatly decreasing fuel consumption and the associated CO2 emissions, as well as improving fishing efficiency and increasing economic returns. Important data for the rational management of fishing resources includes water temperature and phytoplankton biomass, which the Coastal Zone Color Scanner (CZCS) provided until 1986, followed by the SeaWiFS sensors . Active systems such as Light Detection and Ranging (LIDAR) and Side-Looking Airborne Radar (SLAR) to determine the location and size of fish schools, as well as microwave sensors aboard satellites such as SEASAT to map kelp resources along the California coast have also been implemented . Waluda et al. used satellite-derived imagery for another fishing study, albeit through a different perspective. These researchers utilized DMSP-OLS  to quantify squid fishing in the eastern Pacific based on lights. Since commercial fishery of Jumbo flying squid is conducted at night using powerful lights to attract these creatures, Waluda et al. were able to quantify fishing effort based on light signatures of these vessels. “The distribution of lights can be used to observe the distribution and abundance of squid jiggers, and by inference, the distribution of exploited squid stocks, and the location of favorite fishing grounds” . Producing high quality bathymetric maps requires expert personnel and expensive field surveys and high tech equipment, note Ceyhun and Yalçin , who found that Aster and QuickBird imagery could be successfully used to reduce the cost and labor needed to produce bathymetric measurements. In situations where detailed mapping was not necessary, Aster images worked fine, noted the authors, but for detecting local depth changes, QuickBird imagery was superior. Yuan and Zhang  also used QuickBird images to map and monitor the distribution and growth of submerged aquatic vegetation on a large scale. Regarding rock lobster fisheries in Tasmania, Lucieer and Pederson  processed bathymetric data to derive a digital terrain model (DTM) to help track lobster movement. By then applying landscape classifications (developed by terrestrial ecologists) they quantified the degree and spatial distribution of habitat complexity. They accomplished this by classifying each grid in a bathymetric digital elevation model (DEM) into one of six predetermined morphometric landform classes. This provided more complex seabed characterizations that in turn helped quantitatively predict consequences of different management strategies . RS has proven effective as a tool for detecting and mapping broad scale coral reef changes too . By using pan-sharpening methods on FORMOSAT-2 imagery, the authors transformed 8 m spatial resolution images into higher resolution ones, noting a cost savings over purchasing high spatial resolution images alone. The methods involve using the panchromatic (black and white) band with its higher spatial resolution of 2 m, and resampling the other (lower resolution) bands to produce a composite [35,93]. The estimated brightness values of the lower resolution bands are replaced with the higher panchromatic band and this is possible because the latter covers the same spectral range as the visible (red, green, blue) and near infrared bands . Monitoring, predicting and understanding the availability of water and associated changes in quality entails work by Chang et al. , who examine satellite imagery to assess water availability and quantify the hydrological cycle. The authors used GOES (Geostationary Operational Environmental Satellites) , Landsat and MODIS data, ground level radar-precipitation data (NEXRAD), as well as past point measurements (changes in water quality at specific locations, river discharge and precipitation), to create a metropolitan water availability index (MWAI) for Tampa, Florida. Also regarding water availability, Alcântara et al. utilized MODIS data to conduct time and cost effective water quality measures in a Brazilian hydroelectric reservoir (Itumbiara). Using 786 daytime and 473 nighttime images, the researchers computed descriptive statistics (mean, maximum and minimum) to build a time series of day and night monthly mean temperatures used to better understand spatial and temporal variations in the tropical reservoir. Focusing on the Pearl River Estuary in southern China, Chen et al. used RS data as a tool for ecosystem restoration by focusing on turbidity, defined as an “optical effect that is related to the concentration of total suspended solids (TSS) and the shape and size of other impure elements in water” . The researchers recommend using EO-1 ALI satellite imagery (Earth Observing, Advanced Land Imager—10 and 30 m)  for water quality measurements in coastal and estuarine waters. Li and Damen  note that the Pearl River delta “has one of the highest economic development rates of China” leading to loss of agricultural land, sea water intrusion, land subsidence, river siltation and coastal erosion. Combining data from Landsat (MSS, TM and ETM+) (see ) and SPOT imagery (see ) with topographical and nautical data helped Li and Damen  identify coastline changes and related impacts such as the narrowing of river channels, severe flooding, and increased sedimentation, which hinder harbor construction. AVHRR data was used to detect the thermal plume created by the discharge of warm water from the Daya Bay Nuclear Power Station’s cooling system into Daya Bay, China . With a 1.1 × 1.1 km resolution, the authors found that the thermal plumes displayed a seasonal pattern (smaller in winter and larger in summer) and that the temperature difference ranged from 1.0˚ to 1.5˚ from non-plume areas. RS data is also being used to detect sea ice in an effort to monitor arctic conditions. In some cases low-resolution data, 25 × 25 km, is being used to examine sea ice extent and develop regression equations for spring and summer seasons . In this study, Drobot  refers to data gathered from the Scanning Multichannel Microwave Radiometer (SMMR), the Special Sensor Microwave/Imager (SSM/I) and AVHRR Polar Pathfinder. Finally, Wang and Xu  point out how RS techniques can be used to monitor salinity in coastal environments by using Landsat TM images to map salinity distribution in Lake Pontchartrain, Louisiana. They found that Landsat TM bands 1, 2, and 4 were positively correlated to salinity levels and that band 2 helped explain up to 20% of the variance. Meanwhile, bands 3 and 5 were negatively correlated to salinity levels and explained about 30% of the variance. The authors also found that hurricanes, such as Katrina, altered spatial patterns of salinity and significantly increased the average salinity levels. Spot 5 Supermode imagery (processed for 2.5 m resolution) has proven useful for urban planning in areas where sprawl is changing quickly due to rapid house construction and residential development, and where up-to-date information such as timely air photos are lacking. This is often the case in developing countries, and with a 60 × 60 km swath, Duriex et al. used object based image analysis and image segmentation to extract buildings, monitor and estimate urban sprawl in the entire Reunion Island, located in the Indian Ocean. Another way to measure urbanization is via night lights, whereby Sutton  used DMSP-OLS2 and population data as a proxy measure for urban extent. More recently, Small et al. used DMSP-OLS derived data to conclude that the brightness and coverage of stable night lights were correlated with human population density, built area density and economic activity at both the country and global scales . “Night lights provide a means to quantify the size, number and spatial extent of human settlements worldwide” . Landsat MSS, TM and ETM+ imagery was used to study urbanization rates in the Greater Dhaka area of Bangladesh in order to promote sustainable development . The researchers found that as urbanization increased, water bodies shrank; cultivated land, wetlands and vegetation were all reduced. The government did not adequately respond to population growth, permitting settlers to establish themselves in wetlands and low-lying regions prone to flooding . They also noted that land speculation attracted settlers and the subsequent conversion of arable land and natural areas. The authors pointed out that Landsat MSS imagery had a course spatial resolution (79 m) that hampered classification accuracy, thus limiting its use [7,95]. Other data used in this study included: municipal boundaries, road networks, elevation, geomorphic units, topography, demographic, slope and GDP. Important factors included economic development and industrialization, which contributed to rapid urbanization (rise of the ready-made garments industry), while topography affected its direction . Ji et al. formulated urban sprawl metrics that linked construction-based land consumption to remotely sensed land change data in metropolitan Kansas City. They found this method superior to using population data “because usually construction activities, as compared to population change, reflect directly economic opportunities as the major driving force of land alteration,” . Their dataset was composed of Landsat imagery (MSS, TM and ETM+), historical photos, and USGS topographic maps. Landscape metrics, such as patch density, largest patch density and the aggregation index of forested and nonforested vegetation were calculated using the FRAGSTATS3program. The authors were able to identify slow and fast growing areas and concluded that larger spatial units such as metropolitan areas better reveal landscape effects of urbanization . Bhatta et al. note that defining urban sprawl and measuring it is a complicated process resulting in many variations. They define it as: “characterized by unplanned and uneven pattern of growth, driven by multitude of processes and leading to inefficient resource utilization” . They also suggest using the entropy method to best integrate urban sprawl metrics with remote sensing and GIS. According to the authors “Shannon’s entropy (Hn) can be used to measure the degree of spatial concentration or dispersion of a geographical variable (xi) among n zones” . They also note that the imagery used should ideally have a fine enough spatial resolution to represent individual units such as parcels or houses. However, they point out that high-resolution imagery can result in the interpreter identifying high object diversity, which complicates classification algorithms . Nevertheless, their article reviews several approaches to quantifying urban sprawl without applying the entropy method. Meanwhile, Martinuzzi et al. used Landsat ETM+ imagery, along with NOAA air photos and US Census data and urban-rural classifications to identify high and low urban density patterns in Puerto Rico. To assess accuracy, the authors used a random sample of ground control points for urban and non-urban categories evaluated against the air photos. Using this methodology they found that 11% of the island was covered by urban or built-up surfaces and that “Nearly half of the total development is occurring outside of the solid urban centers, covering one-quarter of the best lands for agriculture, impacting watersheds and reducing urban spaces” . When divided into three regions, the researchers found that 16% of the island was Urban, 36% was Sparsely Populated Rural and 48% was Densely Populated Rural. They reiterated the need for the island to have an effective land use plan in a context where the population density rivals that of New Jersey . In many places, such as in developing countries where municipal records, building permits, road construction and utility infrastructure locations are often not readily available or updated, remote sensing can provide “fundamental observations of urban growth and environmental conditions” . These authors note the primacy for monitoring environmental conditions, more so than for urban planning, particularly where informal settlements are continually expanding. In their study they discuss the use of vegetation indices and temperature data from Landsat 7 imagery. Lastly, Rajasekar and Weng  utilized MODIS and ASTER imagery to monitor the urban heat island in and around Indianapolis, Indiana. They used day and night land surface temperature (LST) MODIS images to create a continuous surface and concluded that they offer great potential to monitor the urban heat island phenomenon (whereby air temperatures in densely urbanized areas are higher than those in the countryside). However, heat islands were easier to distinguish in the summer months of June to August. When using ASTER data, the authors found that “areas with maximum heat signatures were found to have a strong correlation with impervious surfaces” . Rhinane et al. looked at urban ground temperature, building density and “cooler” areas. The latter, were vegetated zones, pointing to the importance of green spaces in controlling the heat island phenomenon. Compared to what Siart et al.,  call conventional archaeological GIS applications, the authors in this category propose a multi-method approach to geoarcheaological landscape reconstructions which involve RS, DEM analysis, GPS data, surveying, least-cost analysis, soils, predictive modeling and candidate site selection. Part of their approach involved identifying “aspects of landscape character which might have affected past activity or occupation choices,” rather than directly locating archaeological sites or features . One such tactic was to analyze the spatial distribution of Bronze Age transit roads, which would have influenced the location of settlements in the study area of Crete. Part of their methods involved pansharpening Quickbird MS imagery to 0.6 m resolution and then creating iron oxide ratios (band 3 by 1), as well as infrared ratios (band 4 by 3) . The authors concluded that for the Bronze Age inhabitants slope and topography were important determinants for spatial mobility and still useful for predicting potential road networks and new sites . Predicting archaeological site distribution with RS data go back about two decades. In one example Custer et al. used Landsat MSS imagery to classify parts of central Delaware into land cover classes to help predict the location of prehistoric sites. In another application for archaeology, Daniels et al.,  tested the use of radar to detect buried subsurface reflectors to a depth of 20 cm. The authors used a scaterometer (operating in the P-band at 441 MHz, 68 cm) mounted above a truck as well as on an airplane to conclude that it’s possible to detect buried objects in sandy desert areas up to 4.4 m deep. The authors also highlight numerous potential applications for microwave/VHF radar. They include: tectonic and engineering studies, fluvial geomorphology, glacier covers, subsurface photogrammetry and cartography . In fact NASA radar has been used to explore deep canyons located on the moon . Other projects involving NASA remote sensing and archaeology date back to the 1960s, when black and white and infrared photography from Apollo 11’s SO65 multiband experiment was used to identify human-made prehistoric linear features in Arizona . Since the 1970s, infrared images were found to be useful to archaeology because “buried or obscure cultural features may absorb and radiate solar energy in amounts that differ from that of the surrounding soil matrix, thereby revealing the features on the imagery” . Thermal data is also useful, since “heat transfer through the soil will be affected by the presence of buried objects” . Another application of RS for archaeology includes ground-penetrating radar (GPR), which allows non-invasive site exploration to avoid disturbance during excavation of features in sites of interest . Quarto et al. used this technique to find karst caves that contained prehistoric remains in southern Italy, while Hoerle et al. used it to assess the conservation conditions of prehistoric rock art in South Africa. 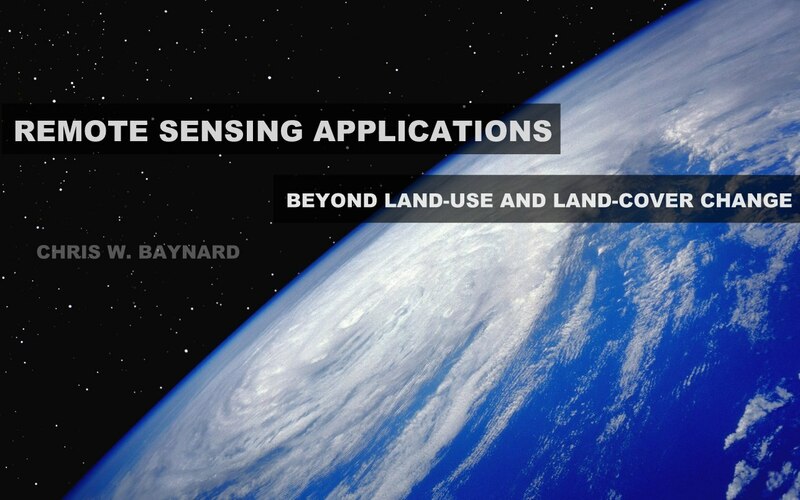 There’s even a journal dedicated to this topic aptly named Remote Sensing in Archaeology. Few researchers are studying the alterations created by oil and gas companies’ infrastructure features on the landscape. These include Janks et al. and Janks and Prelat  who studied vegetation health in and around oil fields, deforestation rates as related to oil and agricultural roads and tracked remediation attempts on abandoned well sites using Landsat MSS and TM imagery. Musinsky et al. used Landsat TM, air photos and videography to examine the relationship between oil roads and deforestation in Guatemala. For other researchers [68-71,99-102] a central goal is to determine “the exact size and extent of the ecological footprint of energy development” . Some of this works applies landscape ecology metrics to quantify the landscape disturbances in oil and gas concessions. These metrics include road or infrastructure density; habitat fragmentation; edge-effect zones; core areas and number of rivers crossed [38,68-69,71,100,101,104-109]. Regarding the landscape infrastructure footprint (LIF) Baynard  examined oil concessions in Venezuela using Landsat TM and ETM+ imagery. Change detection was calculated using the NDVI, a commonly used method for identifying biomass, crop estimates and areas prone to drought [8,110-112], as well as climate change, biodiversity and wildlife ecology . It “is considered among the best known indices and widely used to study and map the plants” . For the oil landscape study in Venezuela, the resulting vegetation change maps showing gains, losses or no change helped determine the contribution of LIF to vegetation change. By also including the size of core areas, agricultural land, as well as the number and location of infrastructure intersecting rivers, the concessions were ranked on their environmental performance. This type of performance can be linked to sustainability. In another study of oil development in remote regions, Baynard et al. examined the spatial relationship between infrastructure pattern related to oil exploration and production (E&P) and parallel activities, surface disturbance and the type of access available in specific oil concessions in eastern Ecuador. This approach combined large-scale Landsat-derived LULC maps, smaller-scale government LULC maps, soils data, protected areas and colonization zones. The authors found that controlledaccess and no-access to oil concessions greatly reduced deforestation rates by keeping settlers from establishing households in these remote regions. Meanwhile, areas where public-access roads, fertile soils and colonization zones overlapped were most prone to deforestation . By assessing ecosystem goods and services, economic activity, natural assets and ecological functions can be linked . Goods and services which we obtain from ecosystems include: “provisioning services, such as food and water; regulating services, such as regulation of floods, drought and disease; supporting services, such as soil formation and nutrient cycling; and cultural services, such as recreational, spiritual, and other non-material benefits” . The first step is to acknowledge that ecosystems have value, or natural capital. Then they have to be valued. This can be accomplished by “assessing the contribution of ecosystem services to sustainable scale, fair distribution, and efficient allocation” . This method focuses on economic or utilitarian value; whereby “ecosystems are deemed valuable because they provide environmental goods and services to humans,” note Abson and Termansen . It does not focus on intrinsic value, whereby an object has a value for its own sake . Yet once a valuation method has been reached, a main way to fund ecosystem management is to provide payments. Known as payments for ecosystem services (PES) , these economic incentives provide a way to manage ecosystems by paying local stakeholders not to cut down trees or convert natural landscapes to other uses such as agriculture or urbanization. Reducing greenhouse gas emissions from deforestation and degradation, known as REDD, is one such approach, which draws on financial resources from developed countries to halt deforestation in forest-rich developing countries [4,5]. This approach is rather new and being implemented by organizations such as the German Development Bank, the Nature Conservancy and the World Bank, with the duel objectives of conserving and managing . Because of its newness, REDD programs are characterized by uncertainty and incomplete information [4,5]; however, as mentioned earlier, advances in remote sensing are improving understanding of social and ecological systems functioning  which can range from intact native ecosystems to highly modified ones . Given that monitoring REDD programs involves detecting LUCC over space and time, RS data and techniques are therefore prime tools to accomplish these objectives. Newer research points to the potential for LIDAR to be used for identifying the forest non-forest boundary, making it “an ideal tool for exact deforestation monitoring”, a key requirement for REDD . This paper has described some of the researches that utilize remote sensing to address problems relating to economics (improving efficiency in fishing, aquaculture, water quality); social and health conditions (malaria, earthquakes and typhoons); improved planning of development infrastructure (urban sprawl, the landscape infrastructure footprint); modeling change into the past and future (archaeology, REDD); and risk assessment (reservoirs, population growth). Clearly the type of work reviewed here overlaps more than one category (i.e., urban sprawl problems that can be economic, environmental and social). The topics to which these studies were assigned were based on commonalities within the research. The paradigm shift, if we may call it that, is that organizations and corporations possessing environmental assets need to understand their roles as land managers and engage in better oversight of the land and people where their assets lie and their economic activities take place. This means paying attention to the triple bottom line of sustainable development: economic, environmental and social issues across all company operations. The way to approach this is to value ecosystem goods and services that are offered by the landscapes under their management—that is, valuing natural capital as one of society’s most important assets . A proposed method of implementation is via precision land management (PLM). This set of practices builds on methods used in precision agriculture to integrate layers of data used to promote variable management practices within a given agricultural field [119,120]. In this case, instead of better predicting crop yields, applying fertilizers and pesticides only in the right locations to increase production and efficiency, extractive industries and others operating in natural areas would efficiently manage the activities and infrastructure affecting habitats and people in and around their natural assets. As Mathieu  observes: “Earth Observation (EO) satellites can play a key role in this endeavor, as they are uniquely placed to monitor the state of our environment, in a global and consistent manner, ensuring sufficient resolution to capture the footprint of man-made activities”. Through this approach major actors would be in a better position to predict outcomes of the social, environmental and economic interaction that result in a successful operation. By incorporating socioeconomic data and stakeholder input with RS data in a GIS environment, these land managers could “see” what portions of a given real estate are being/might be altered or converted; the relationship to natural areas (for both conservation and remediation purposes); the location and activities of local villagers, indigenous groups and land managers; as well as actions from competing economic actors such as loggers, hunters, gold miners and local resource users. This paper has focused mostly on the application of passive remote sensing satellite imagery. Nevertheless, many applications have not been covered in efforts to provide a general overview—such as CBERS data (see ). Recent developments in the use of Radar and LIDAR should be further explored. Regarding radar, for example, Interferometric SAR (InSAR or If SAR) has been used to develop terrain elevation data and subsequent multiple data sets have been compared to monitor land deformation with centimeter precision . If SAR applications can detect whether a vehicle has moved along a road, data fusion methods that combine Geo SAR data with AIS (automatic identification system) ship transponder signals, optical image data and in situ information can detect whether a ship is hiding something . These secret activities could indicate illegal fishing or illegal oil discharging . Other noteworthy developments are real-time in-flight processing, “which is especially important for rapid response, emergency management, and intelligence, surveillance and reconnaissance (ISR) applications” and the introduction of video into commercial airborne photo-grammetry . Nevertheless, throughout the papers examined here, Landsat imagery comprises key data sets due to their continuous global coverage and free availability. And now, the recent release of Landsat 8 in February 2013  is a boon to EO researchers, since this satellite overcomes the challenges created by Landsat 7’s malfunction in 2003 . This work was based on a white paper written for Chevron Corporation’s Next Generation Remote Sensing Team. Any errors, omissions or oversights are solely those of the author. Copyright © 2013 Chris W. Baynard. This is an open access article distributed under the Creative Commons Attribution License, which permits unrestricted use, distribution, and reproduction in any medium, provided the original work is properly cited. H. Hanaizumi, M. Akiba, H. Yamano and T. Matsunaga, “A Pan-Sharpening Method for Satellite Image-Based Coral Reef Monitoring With Higher Accuracy,” Proceedings of the 11th International Coral Reef Symposium, Ft. Lauderdale, 7-11 July 2008, pp. 626-630. P. P. Mathieu, “Sustainable Development Using Earth Observations: Accounting from Above Forestry, Hydropower and Mining,” Imaging Notes, Vol. 25, No. 4, 2010, pp. 24-27. X. Li and M. C. J. Damen, “Coastline Change Detection with Satellite Remote Sensing for Environmental Management for the Pearl River Estuary, China,” Journal of Marine Systems, Vol. 82, 2010, pp. S54-S61. M. J. Giardino, “A History of NASA Remote Sensing Contributions to Archeology,” Journal of Archaeological Science, Vol. 38, No. 9, 2011, pp. 2003-2009. A. N. Hassan, N. E. Nogoumy and H. A. Kassem, “Characterization of Landscape Features Associated with Mosquito Breeding in Urban Cairo Using Remote Sensing,” The Egyptian Journal of Remote Sensing and Space Science, 2013, pp. 1-7, in Press. J. S. Janks, A. E. Prelat and J. D. Wieser, “Remote Sensing Technology Applications to Environmental Assessments in the Oriente Region of Ecuador,” Second Thematic Conference on Remote Sensing for Marine and Coastal Environments, New Orleans, 31 Jan-2 Feb 1994, pp. 633-644. S. Pontius and K. Boyer, “In Fields Afar, NGS Product May Be Warfighters’ Only Friend,” National Geospatial Intelligence Agency, Springfield, 2007. S. Marchant, “Toolkit Empowers Warfighters for NetCentric Warfare,” National Geospatial Intelligence Agency, Springfield, 2007. P. Morton, C. Weller and J. T. Thomson, “Energy and Western Wildlands: A GIS Analysis of Economically Recoverable Oil and Gas,” The Wilderness Society, Washington DC, 2002. P. Morton, C. Weller, J. Thomson, M. Haefele and N. Culver, “Drilling in the Rocky Mountains: How Much and at What Cost?” The Wilderness Society, Washington DC, 2004. R. T. T. Forman, D. Sperling, J. A. Bissonnette, A. P. Clevenger, C. D. Cutshall, V. H. Dale, et al., “Road Ecology: Science and Solutions,” Island Press, Washington DC, 2003. J. R. Jensen, “Introductory Digital Image Processing: A Remote Sensing Perspective,” 3rd Edition, Pearson Prentice Hall Inc., Upper Saddle River, 2007. S. Aronoff, “Remote Sensing for GIS Managers,” ESRI Press, Redlands, 2005. D. J. Abson and M. Termansen, “Valuing Ecosystem Services in Terms of Ecological Risks and Returns,” Conservation Biology, Vol. 25, No. 2, 2011, pp. 250-258. 1In December 2010, Google Labs released Google Earth Engine, a project that uses 25 years of Landsat TM and ETM+ data to enable global change monitoring. A primary aim is for developing nations to monitor their forests and to serve projects such as REDD (Landsat News, 2010). 2DMSP-OLS data was also used by Waluda et al., (2004) to detect night fishing efforts in the eastern Pacific. 3“FRAGSTATS is a computer software program designed to compute a wide variety of landscape metrics for categorical map patterns” (UMASS Landscape Ecology Lab, 2011).